Please note that these really work best if you make 12 standard muffins plus a mini-loaf (3” x 5”). Otherwise the muffin tins get too full, leaving the centers uncooked when the edges are done. butter or oil for greasing your muffin tin and mini loaf pan. In a medium bowl, whisk all the dry ingredients (but not the brown sugar) until well combined. In a large bowl whisk together the oil and brown sugar until thoroughly combined. Add the eggs, one at a time, whisking well after each addition. Then add the vanilla extract and the mashed banana and beat well with a spoon until fully blended. Add 1/3 of the dry ingredients to the wet ingredients and stir gently to combine. Then add 1/2 of the mango puree and stir until combined, and repeat with another third of the dry ingredients, then the remaining half of the mango. 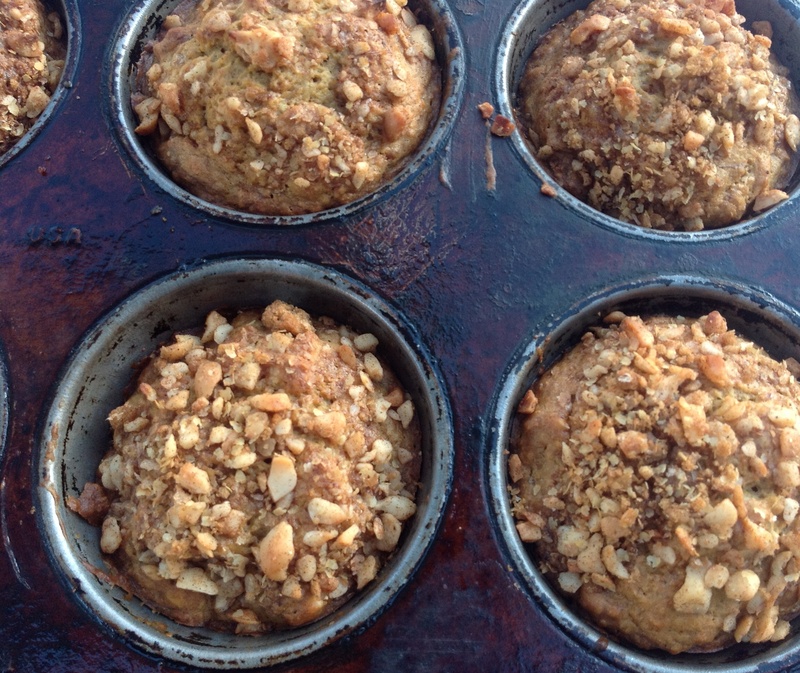 Fill the greased muffin tin -- batter will come up about 3/4 of each cup -- and the mini-loaf. Then sprinkle a bit of topping on each muffin and the mini-loaf. Bake the muffins for 22 - 25 minutes, rotating the tin halfway. They’re done when they spring right back when lightly touched with your finger. The mini-loaf should take another five minutes or so. Use the same method to test, right in the middle of the loaf. Remove to a cooling rack right away and allow to cool for at least ten minutes before eating.